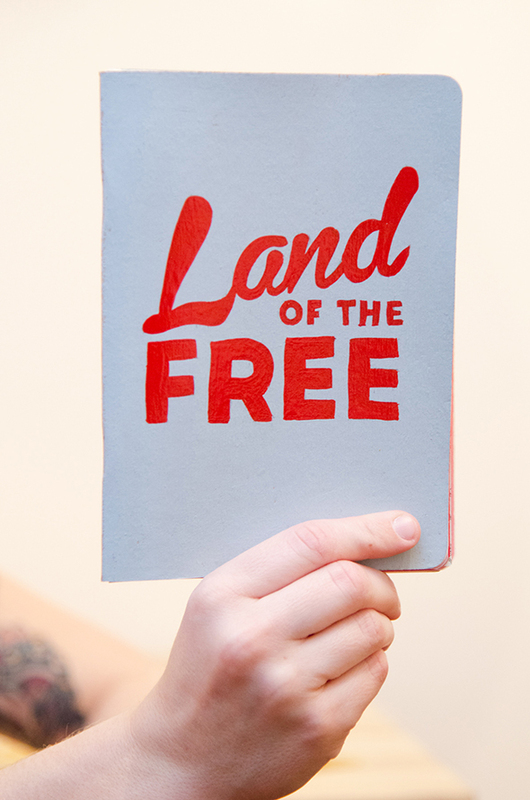 Jenn Shauger is a designer at M Studio in Asbury Park and recently submitted her work for The Sketchbook Project, a global, crowd-sourced art project and interactive, traveling exhibition of handmade books. We caught up with Jenn to talk about her art background and what inspired her to join this “taco truck only with books” which will be passing through Brooklyn and Philadelphia sometime this summer. First off, how did you become interested in art? I’ve been “practicing” or doing art since I was younger – drawing and painting. My interest in design began in high school. I always try to be productive in one way or another, using my hands to paint but also creating work on the computer (design), it’s a nice balance. Over the past few years I’ve developed an interest in sign painting; my grandfather was a sign painter for Yates sign Co., so I guess I’m trying to keep the sign painter spirit alive. I find huge inspiration in the work of Stephen “Espo” Powers and Aaron James Draplin, of Draplin Design Co. as well as hand painted signs that still linger around to this day. I graduated from Mason Gross School of the Arts / Rutgers University in 2010 with a BFA in Visual Arts, and I’m currently working as a designer at M studio, right here in Asbury Park. Working there has been awesome, cool people, a wide range of projects and a non-stop creative environment. 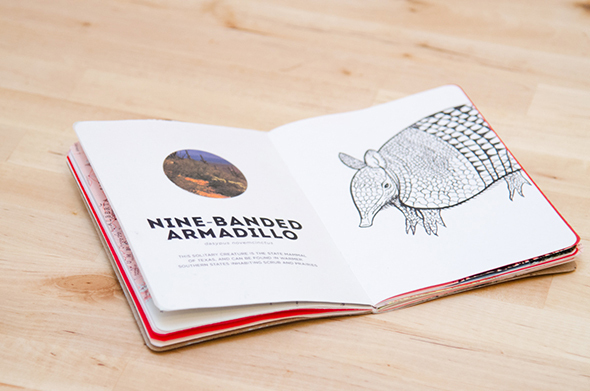 How did you hear about the Sketchbook project? I actually came across the website randomly one day, and just kind of read further into it. It just sounded like a really interesting thing to be apart of, thousands of people’s sketchbooks residing in one permanent location- The brooklyn art library. What inspired you to submit a book? Well outside of work, I had been painting quite a bit , using 1shot enamel paint (my favorite medium, it’s just so glossy and beautiful!) on wood. I would paint wild animals, cowboys and things of the west (and still do). Anyway, I would create these, out of enjoyment and just try to master the act of the “smooth and straight line”, but I wanted to create something that could be tactile and interactive, as opposed to an object that you just look at and admire. When you look through a book, or booklet, every turn of the page is an experience. Don’t get me wrong, I still love painting but just needed an alternative outlet / change of pace. My next project is to paint a series of paintings based on Glen Campbell songs, “Wichita Lineman, ” “By the time I get the Phoenix”, etc. They would make great visuals. I just like to paint what inspires me – nature, America and everything in between. Tell me about the concept behind your submission? It was like a blank canvas that I kind of stared at for a while, until I figured out what I wanted to do. Being a graphic designer, I wanted to incorporate some typography and mixed media within the layout, complemented by rough sketches, with black india ink. 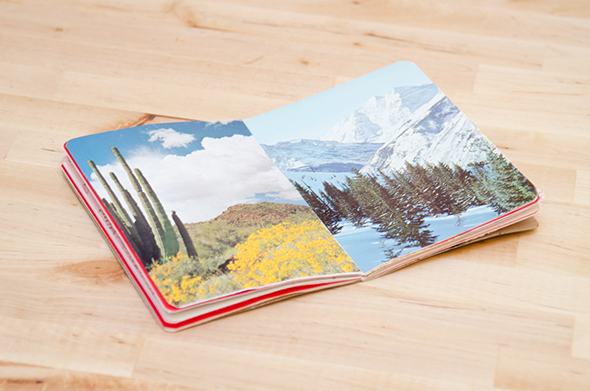 There are page breaks with repurposed pages of an old Atlas that I had, as well as images of cacti and mountains from some old Life Nature library books. 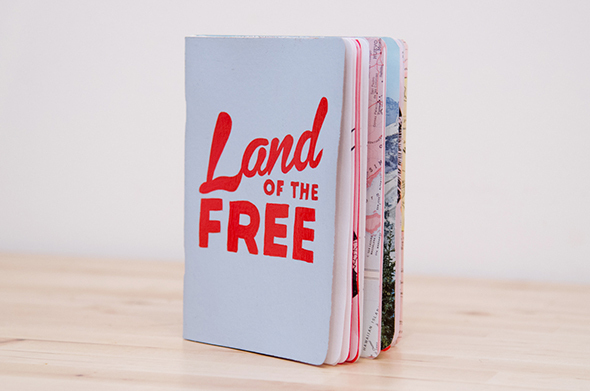 I titled my book “Land of the Free”, as it highlights wild creatures and their habitats throughout North America. On the cover, I hand painted the title using 1shot paint. How does it feel knowing that potentially millions of people from all over the world will see your work? It feels pretty cool to be one part of a whole. I am just one of the many people that makes up this large project. Hopefully I can inspire and make someone smile when looking at my book. How can someone reading this get involved with the Sketchbook Project? They can go to http://www.sketchbookproject.com/sketchbookproject and sign up for the next tour! I Totally recommend it, it’s a great way to stay productive. 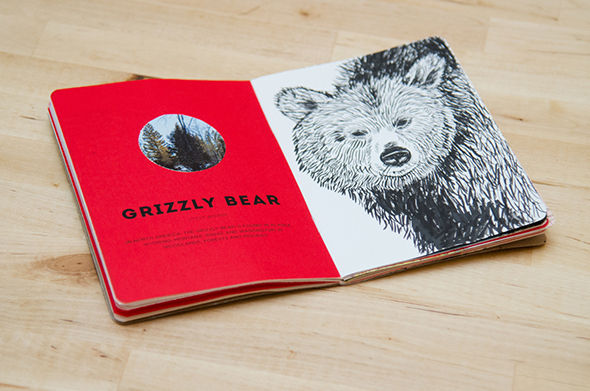 They give you the option to digitize your sketchbook, so it will be featured within the online library, where viewers can flip though each person’s sketchbook. See more of Jenn’s work here and support the cause – buy some of Jenn’s work at her etsy store. This entry was posted on Thursday, January 30th, 2014 at 1:07 pm. It is filed under ART. You can follow any responses to this entry through the RSS 2.0 feed.